While serving time in a Texas high school, Tig failed three grades by entertaining classmates rather than entertaining the notion of a successful academic career. She decided to drop out of school in 9th grade and move to Denver, CO., where she worked briefly in the music industry before moving to LA to lodge herself firmly into the world of comedy. Tig has appeared in a number of television shows and most notably as “Officer Tig” in The Sarah Silverman Program. Tig has also guest starred on The Office, Community, Bob’s Burgers, The Life & Times of Tim, In The Motherhood (with Megan Mullally and Cheryl Hines), Dog Bites Man (with Zach Galifianakis), was a recurring guest-host on Movies at Our House, had her own half-hour special: Comedy Central Presents Tig, she’s a regular on Conan and has also appeared on Late Night with Jimmy Fallon and Jimmy Kimmel Live among others. Tig has become a regular on PRI’s This American Life with Ira Glass and has contributed to The Moth storytelling series. Some of Tig’s writing credits include The 63rd Primetime Emmy Awards hosted by Jane Lynch and The 2010 MTV Movie Awards hosted by Aziz Ansari. In 2013, she made her feature film debut in In A World and can be seen in recent releases Shreveport with Ryan Phillippe and Walk Of Shame with Elizabeth Banks. In 2006-2007, Tig performed as part of a series of house concerts across the country in the living rooms, basements, rooftops, garages, backyards, lofts and barns of fans. The tour featured rotating guest comics and local MCs in each town with occasional surprise celebrity drop-ins. Look for it on Showtime as a special: Knock, Knock It's Tig Notaro. In 2011, Tig released her first CD entitled Good One along with the DVD Have Tig at Your Party. HTAYP features her standing still for an hour and speaking infrequently into the camera, in hopes of blending into any party once you press play. A la the burning log in the fireplace video. Have Tig at Your Party also includes an infomercial with testimonials from fellow actors and comedians about what it was like to actually have had Tig at their parties. Over the years, Tig has also worked on various short films funded by director Sam Raimi (Spider-man, Evil Dead, Simple Plan), and started the highly unknown and unsuccessful, “ZeroDollarsAndZeroSenseProductions” with her producing partner and childhood friend, Beth Schorr. 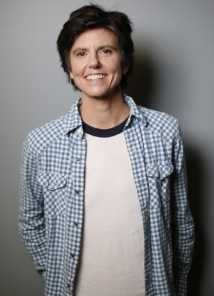 These days, Tig performs regularly at the Hollywood Improv, the UCB Theater, and Largo at The Coronet Theater in her monthly show, “Tig Notaro and Friends”….. and of course, headlining festivals, clubs, colleges, theaters, and living rooms across the universe. Tig currently resides in Venice Beach, CA, on the same street as Julia Roberts, but in a much smaller house. Sexual Defense 101 with Professor Tig Notaro.